Keeping your smile healthy and pain-free is a lifelong process that involves good dental hygiene and regular visits to a dentist you can trust. Dr. Nikunj Raiyani, general dentist at Hanford Family Dental Center located near Coalinga, CA, provides professional, friendly dental care for the whole family. Dr. Raiyani and his team provide preventive care visits and treatment for all types of oral health issues to kids five years and older and adults of all ages. Regular preventive care visits are vital to maintaining the health of your teeth, gums, and mouth. At routine hygiene visits, a member of your dentist’s team will professionally clean, floss, and polish your teeth. They may also apply preventive treatments such as fluoride. Your dentist will check over your mouth to ensure that your teeth and gums are healthy and that your bite is aligned, and to screen for other issues such as oral cancer. If your dentist finds any issues with your teeth or gums, he will provide you with options for treatment that are appropriate for your individual needs. If you have cavities or tooth decay, the doctor will repair your tooth with the best materials available to ensure long-lasting, pain-free results. Modern technology for composite fillings ensures that your repaired teeth will look natural and will last for decades if you take care of them at home. Minimal enamel is removed during the process of creating your filling, which ensures that you keep as much of your natural tooth as possible. Your dentist can also provide treatment for cracked, chipped, or missing teeth. Bridges, crowns, dental implants, and veneers are different options that are used to repair damaged teeth. Your treatment will depend on the severity of the tooth damage and the health of the surrounding teeth and gums. Gum inflammation, called gingivitis, can progress into periodontitis, if left untreated. A general dentist can identify gum issues and provide you with a treatment plan. A variety of gingivitis and periodontitis treatments are available to help lessen your symptoms and stop the disease from spreading. Your dentist will also recommend home care treatments you can do to return your gums to optimal health. The dental care needs for children are different from those of an adult, and Dr. Raiyani understands and caters to these differences in the care he provides. Early dental care for children is primarily focused on the prevention of oral health issues, the formation of good hygiene habits, and detecting and treating cavities and other potential dental problems early on. In addition to getting a professional cleaning at regular hygiene appointments, your child will be assessed for possible issues with their teeth and jaws and likelihood of cavities and tooth decay due to their tooth structure. A dentist can also refer your child to an orthodontist if appliances may be needed to better align their teeth or jaw. If your child has deep grooves in their molars, they may be more likely to form cavities because it is hard to clean deep down into those surfaces. Sealants are a common preventive treatment provided to children in this situation. They are applied to the surface of your child’s molars and seep deep into the crevasses, which fills them so that bacteria cannot form cavities. 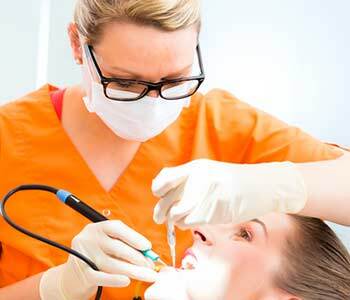 Sealants are painless, quick to apply, and long-lasting. Children’s teeth are small and therefore cavities can be harder to detect. Dr. Raiyani’s office uses laser cavity detection technology, which can find even the smallest of cavities so they can be treated before they progress further. Hanford Family Dental Center provides reliable, professional oral health care for the whole family. The friendly, outgoing team is committed to providing individualized, pain-free dental care that leaves you confident in your smile and satisfied with your experience. The office in Hanford, CA is convenient for people in the Coalinga, Lemoore, Avenal, and Corcoran areas. Call Hanford Family Dental Center at (559) 530-8080 today to schedule your visit and experience the highest quality of care for your whole family! Can a chipped front tooth be repaired at a dental practice near Lemoore, CA? Residents in Corcoran, CA ask, "Does a dentist near me utilize innovative technology to identify oral health conditions?"